The cottages we most associate with Stacey farm are the two at the beginning of Stacey Avenue. They were probably built around 1890. This photo, probably dating from the 1920s,shows the farm gate that led to Stacey Hill Farm. In the background you can see the Moon street school. There were earlier versions of these cottages which were to be found at the bottom of Green Lane. 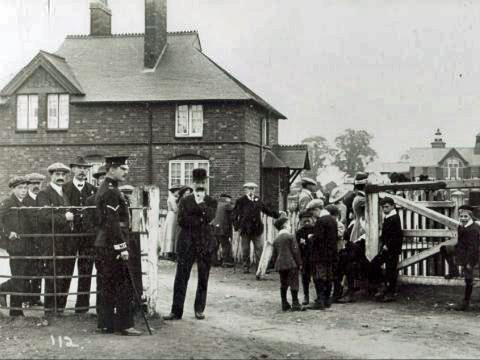 In censuses from 1851 onwards they are identified as such and at least one of them was inhabited by a shepherd, leading one to believe that bush fields and the fields latterly occupied by Wolverton expansion in the 1870s and 1880s were given over to pasture. About the time of building the Gables, these cottages were acquired and converted into a single dwelling lodge house. 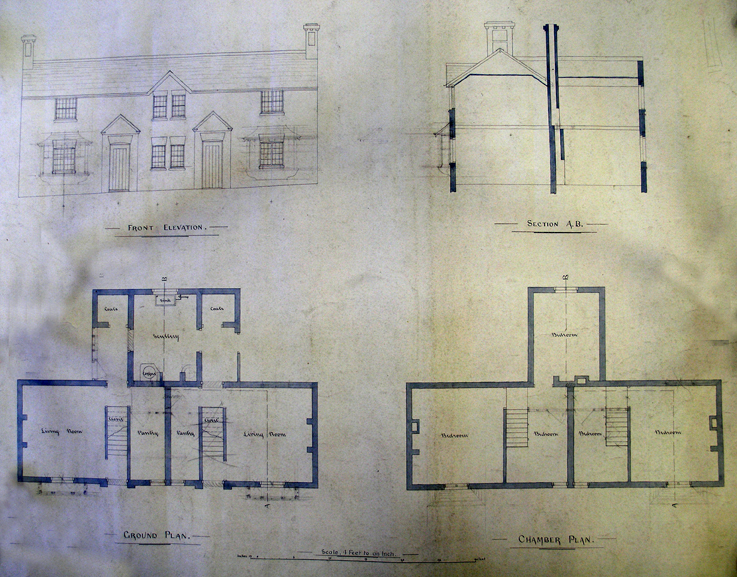 Plan drawings survive in the Buckinghamshire Record Office which I reproduce here. The drawing is undated but it is probably late 1880s. One of the staircase is scribbled over with pencil, indicating that this was to be removed. The front elevation is probably as it looked before the conversion. Unusually, perhaps, for a manor of Wolverton’s size and wealth, it has never been dominated by a big house, occupied by the local ruling family. Most of the surrounding manors – Calverton, Loughton, Hanslope, Cosgrove, Gayhurst, Tyringham, Linford – had one big house that was marked out for the local gentry. Wolverton was probably exceptional, for a number of reasons. Firstly, the ruling family sold the manor in 1713 to Dr John Radcliffe. Thereafter, due to his death a year later, it was managed by a Trust, essentially a committee, none of whom were resident. They employed land agents to manage their affairs and until the arrival of Thomas Harrison, whom I will come to in a moment, none of them were resident either. Thus, the only people of significance on the manor were the four or five farmers and the vicar. This small group made up the middle class with no upper class family above them. The early “great house” must have been that built by Baron Mainou inside the motte and bailey castle at Old Wolverton. We have no idea what it looked like and no archaeological excavations have ever been undertaken to give us any clue. It seems likely that after 300 years the castle would have been abandoned in favour of a more comfortable house. We have no idea what sort of building was there in the 14th century, but we can assume, given the relative wealth of the de Wolvertons, that it was a splendid enough manor house for the period. From surviving knowledge of domestic architecture of that era, the house at Wolverton probably had a great hall, where all the activities of the house took place, including providing sleeping places for the servants, and attached to it, possibly at right angles, was the private chamber for the lord and his immediate family, often known as the solar. Kitchens were usually housed in a separate building set away from the great hall, as a precaution against the all too frequent risk of fire. We do not know if this house was of timber or stone construction; all we can presume is that there was a house there and it was of a standard befitting its occupants. This must have been followed by a succession of medieval houses on or near the site occupied by the de Wolverton and de Longueville families and it is fair to guess that they became progressively larger. There is some evidence that the house was largely rebuilt in 1586 and it probably ranked as a fine Elizabethan mansion. One visitor, Thomas Hearne in 1711, was impressed with the building. The location was most likely that piece of levelled ground above the former rectory. At the time of Hearne’s visit Sir Edward Longueville was only living in part of it and the house was in a state of general disrepair. Sir Edward’s debts and general mismanagement were catching up with him. After he sold the manor to Dr Radcliffe the Trust deemed the house to costly to renovate and the house was eventually dismantled. Parts of it were used to build the Rectory opposite. Wolverton lost its great house. The other factor that must be considered is the existence of Stony Stratford on Wolverton’s western edge. The commercial opportunities afforded by the Watling Street created an extended middle class of innkeepers and tradesmen as well as some sheep farmers who did very nicely out of wool profits in the 15th century and could live in some style in larger houses at Stony Stratford. But my general observation is that after 1713 there was no “upper class” family living in Wolverton. In 1773 the intriguing figure of Thomas Harrison became the land agent at Wolverton. He was already the land agent for Earl Spencer and was at the time living in the Wittewonge mansion at Stantonbury. He was also the land agent for the Earl of Uxbridge and seems to have used his connections to make a great deal of money out of copper mining, smelting industries and canal ventures. In 1780, when the proceeds from copper mining in Anglesey were flowing plentifully he decided to build his own pile at Wolverton. The Stantonbury mansion was in a state of decay and I guess that Earl Spencer was reluctant to put money into it. Wolverton, being close to the Watling Street, must have seemed an attractive location for Harrison, whose business dealings were taking him to London, Staffordshire and North Wales. So, over the next four years Wolverton House came into being. It cost Harrison about £1,840 – a massive sum in its time. It was then, and remains, Wolverton’s largest house. By the standards of the really grand houses that were built across the country in the 18th and 19th centuries, it was a modest building, big enough for the family and a modest number of servants, but it was no Downton Abbey. Harrison’s younger son Richard continued as land agent for the Trust and lived there with his family until his death in 1858. His widow, almost a generation younger than her husband was allowed to live in the property until her death. The house, although built at Harrison’s expense, was always the property of the Radcliffe Trust and they continued to rent it out until 1970, when it was sold. A third house must be considered, The Gables. This spacious house was built in 1880 for the Works Superintendent and was first occupied by Charles Park. Although it was a large house by any Wolverton measure, it would never have been considered a great house. It was a middle class house, suitable for the family and a couple of servants. In the 1960s the practice of providing tied houses for employees became outdated. House prices were rising fast and while an earlier generation had been able to live comfortably in tied housing all their working life and purchase a house on retirement were discovering that house-price inflation was leaving them high and dry. The Gables was by then out of date. It was demolished and replace by the tower block that now bear its name. 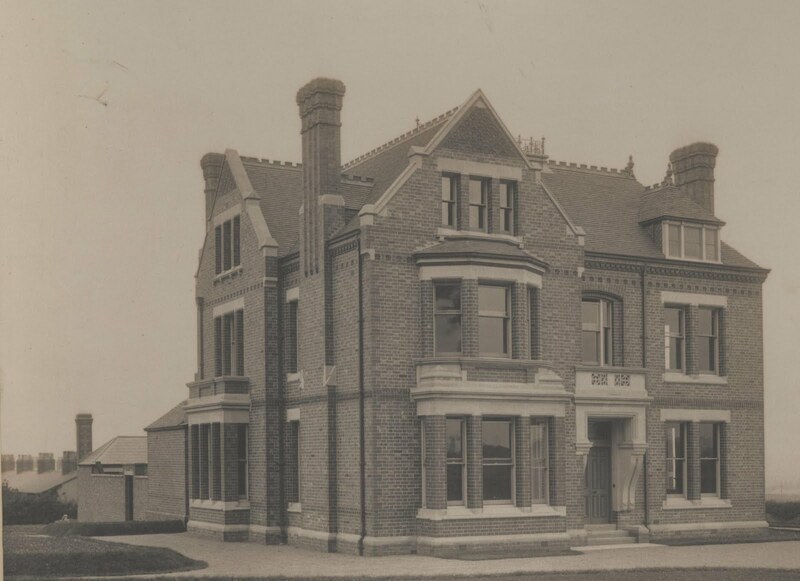 After 50 years of modestly-built houses for various grades of employees, Wolverton finally got a large house for its most senior employees, the Works Superintendent, It was built at the end of Ledsam Street on an acre or two of unused railway land. The new, ample, but not particularly grand house was to be called The Gables. The picture above if probably the first ever photograph of the newly completed building. Later photographs tended to show walls thickly covered with ivy. The Gables had a relatively short history and only seventy years later was torn down. In its place the Council erected a tower block with all the inadequacies of 1960s steel and concrete design. It was named The Gables in a nod to its predecessor. Ironically, it seems set fair to outlast the Victorian building in age. A full history of this building can be found here. Phillip Webb mentioned that there had been ye another fire at The Gables and suggested that it may be time to tear it down. Perhaps. It’s been there for almost 50 years and other than affording a fine aerial view of Wolverton and district I doubt if it has much more to recommend it. It does occur to me that after all this time few people in Wolverton know why this particular high rise block of flats is called “The Gables”. Here is a brief history. The premier job in Wolverton was that of Works Manager. 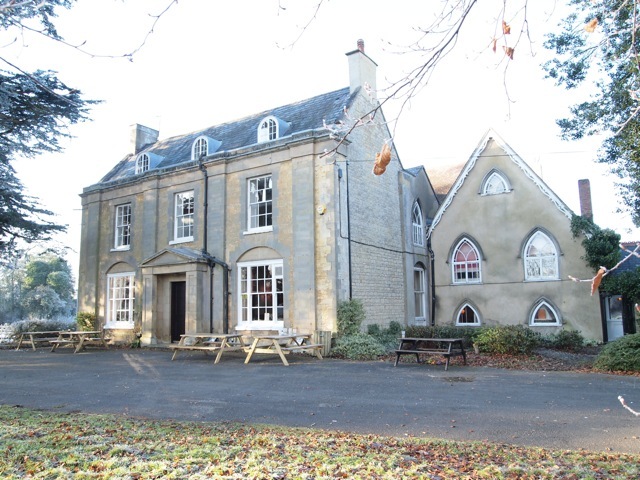 The first works manager, Edward Bury, lived at the Parsonage at Great Linford after May 1841. He was succeeded by J E McConnell, who lived at Wolverton Park House. His successors lived in one of the villas. Richard Bore lived in the much enlarged Villa 338 until he retired and it was then pulled down to make room for workshop expansion. I should mention here that the construction of a suitably large house for Richard Bore was discussed by the Board at the time of his move from Saltley, but there was no action taken when Henley Villa became available. 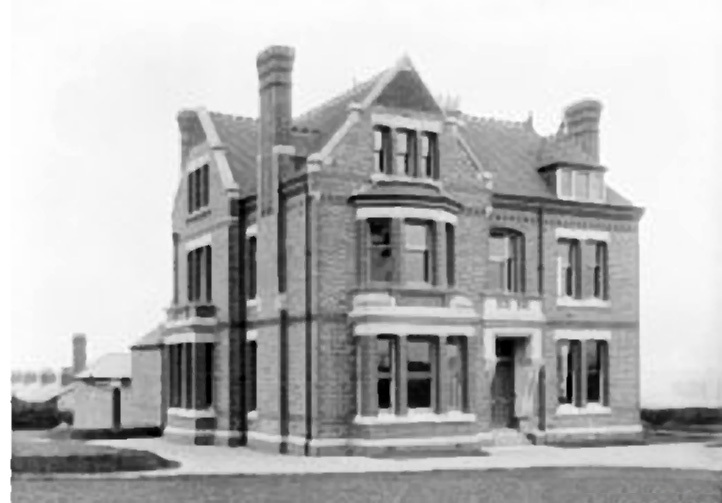 The new house, called The Gables, on an acreage south of Ledsam Street was a substantial house although not a large house by 19th century standards. In dimensions it was approximately 40 feet square with a large kitchen and scullery addition. The downstairs plan provided for a Morning Room, Drawing Room, Dining Room and Study. Upstairs offered three large bedrooms, a dressing room and a bathroom and the attic floor provided quarters for the servants. So while The Gables represented Wolverton’s largest house it was by no means palatial and was in keeping with Wolverton’s democratic foundation. It has to be said that although there was a hierarchy of workers in Wolverton, everyone was a worker, a circumstance that had a great bearing on the political leanings of Wolverton in the 20th century. Apart from the Villas, which I will discuss in the next chapter, larger houses were scarce in Wolverton. A few three storey terraced houses started to appear in Church Street in the 1860s but Wolverton would have to wait until the 1890s for roomier housing stock. In that decade more spacious houses were built on the Square, in between Cambridge and Windsor Streets on both the Stratford Road and Church Street, and on Green lane the two large houses known as The Beeches and Yiewsley. Richard Bore retired as Superintendent in 1886 and moved back to Birmingham with his third wife. He was replaced by the young Charles Archibald Park, then barely 30 years old, who became the first occupant of The Gables. He was a single man on his appointment and the 1891 Census records only a housekeeper and servant; Park was staying with relatives in Haworth Yorkshire on that day. He was the son of John Carter Park, himself an eminent mechanical engineer. In 1891 he married his cousin Marion Redman, the daughter of a Yorkshire mill owner and by the time of the 1901 census they had two daughters and a vastly expanded complement of servants. Park may take the credit for transforming Wolverton Carriage Works into the leading factory of its kind in the country. When he took over from Richard Bore the L&NWR was lagging behind its competitors in both the quality and design of its carriage stock. Park changed that. Not immediately, because he had to come out from under the controlling thumb of the Chairman, Sir Richard Moon. Once Moon retired in 1891, Park was free to implement his designs, which were built on a frame supported by six wheel bogies and were equal in quality to the American Pullman Cars. The designs were first applied to dining cars and sleeping cars which then led to the concept of the corridor train where travelers could access the dining cars from any point in the train on their journey. It was in part because of its dominant position as a railway company and in part because it had most of the major trunk routes that the L&NWR designs began to set the standard, but C.A. Park can take credit for leading the Company, and Wolverton, from its somewhat secondary position in the 1880s. The Gables survived for less than 100 years and it was demolished in 1963. The tower block is hardly a worthy successor and one doubts that it will last even as long as its eponymous predecessor. 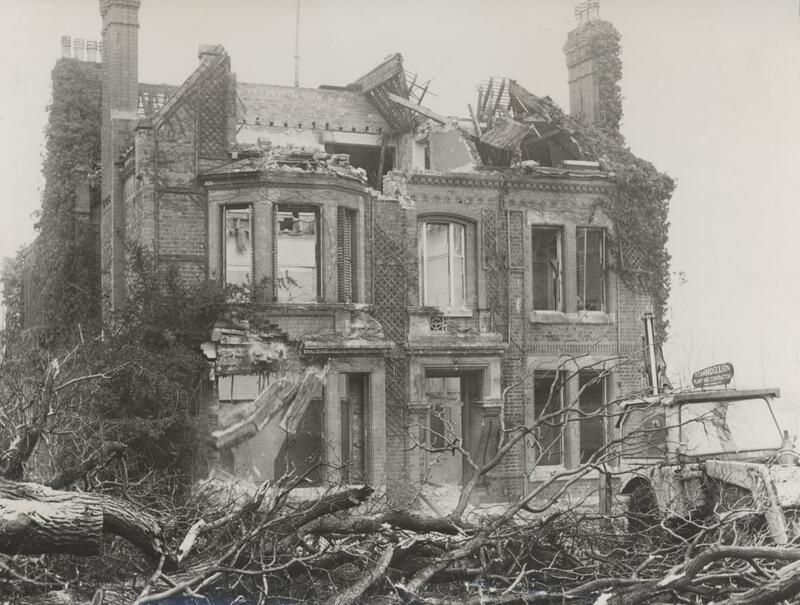 This consent for its demolition, like so many of the decisions affecting buildings in Wolverton, was a company decision – by this time British Railways. There were no public hearings, nor was there any public outcry.